Ice Age is here again, and it brings us … dinosaurs. And mammoths that float around using on giant slabs of ice. This a very weird Ice Age indeed. When you have a sequel to a popular film the desire to do a poster that looks kind of similar to a previous poster but WITH MORE STUFF can be quite strong. Overwhelming even. So it’s no surprise we have seen a French poster not entirely dissimilar to this one before. However, as understandable as that can be, it rarely ever leads to great posters. Sometimes it even leads to some really bad ones. 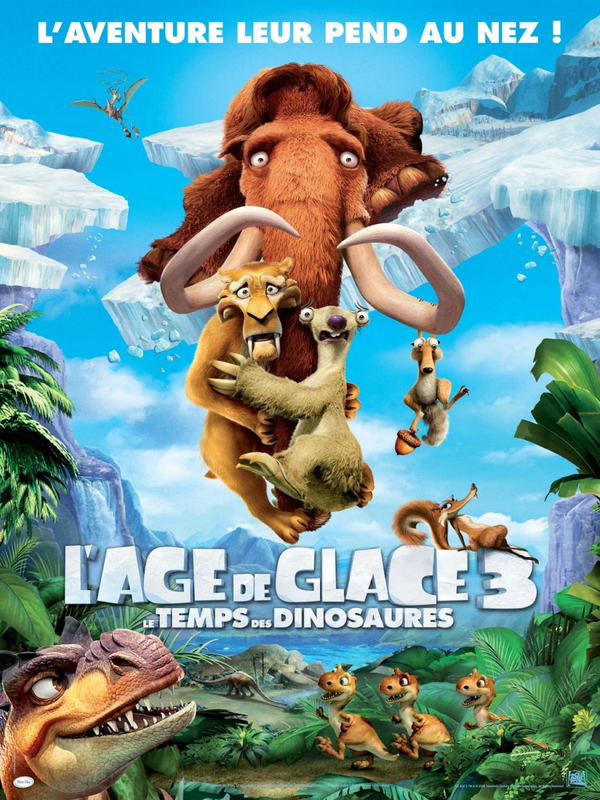 But the Ice Age franchise has always coupled some uninspired posters with some very interesting ones. And the best poster for Ice Age 3 has probably already been released. So I’m not specially concerned that this isn’t a very good poster. Waiting for Ice Age 3 to release…!! !